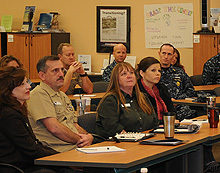 The Navy College Office oversees the entire post secondary education program on board Naval Air Station Whidbey Island. There are three top quality colleges partnered with Navy College as well as several contractors that assist in the delivery of a comprehensive and well rounded educational experience. Pre-college courses, certifications, technical and traditional degrees are available.